Why play at a convention? Secondly, conventions offer an opportunity to try games and styles you may have never played before. Our gamemasters both write and run their modules and we encourage all styles and genres of games. 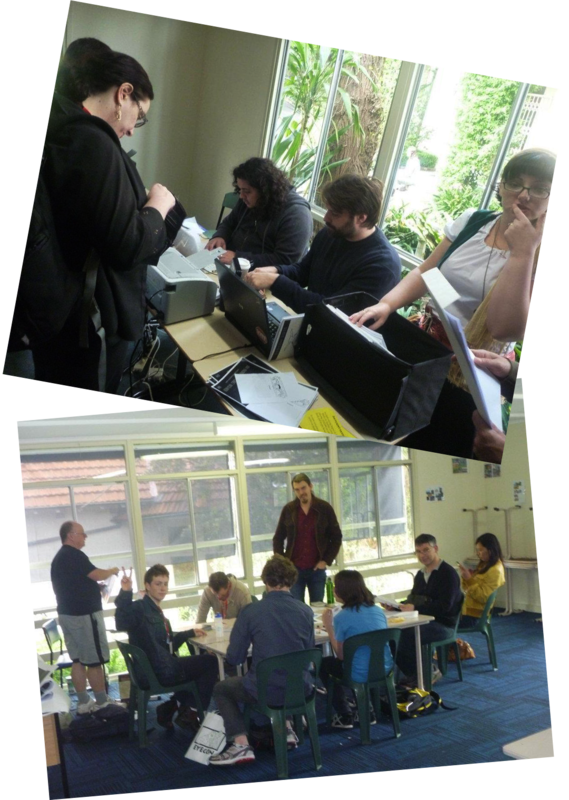 This means that what you get at SYDCON is an entirely unique and often highly diverse roleplaying experience. The majority of modules we run have never run before and will never run again. In one day at SYDCON, you could play a plot-heavy Star Wars game, a character driven Freeform and a dungeon-bash Dungeons and Dragons game (and you've still got 2 more days to go). The effort that goes into these games is astounding and we are always amazed by the high quality games we are able to offer thanks to the effort and passion of our GMs. On top of that, we also sometimes run card games, board games and miniatures games, which helps you further diversify your gaming experience. You also get to see how other people run games (always good for improving your own games), find out how other go about writing a game, and also play games that may not be possible with your regular gaming group. For example, a 30 player freeform game is difficult to organise for one person, but these type of games run at every convention and offer an entirely different type of roleplaying experience to tabletop roleplaying. Start by reading the blurbs for games on offer (found on the Games page). These blurbs are designed to give you the flavour of each game. You'll notice that most mention little about rules. That's because picking a game is about finding a genre/theme you connect with. It's best to look through and find games that grab your attention. If it grabs you first go, you're more likely to enjoy it than something you're playing because 'it's what everyone else is playing'. Also remember role-playing is a highly varied hobby. One game can be very different from another. Just because you didn't like one genre doesn't mean you won't like something different. The same goes for rules systems. Different systems encourage different styles of role-playing. If it's your first time, signing up for a whole bunch of different games is the way to go as it will give you an idea of what you might like. None. SYDCON games assume no previous rules knowledge. So don't be put off because you're worried you won't know the rules. We run so many different systems there would be few players who knew all of them. Gamemasters (individuals who run the games) expect you won't know the rules and will run their game accordingly. If you do know the rules it's an added bonus but it won't affect your fun if you don't. Games run for 3 hours and there are 3 sessions a day (2 on the Monday). You can play one session or play all 8 sessions at SYDCON. Between each session we have a 1 hour break allowing you to have a rest, grab some food, and generally socialise with other con attendees. When you first arrive at the convention, you need to come to the registration desk where you can pick up your rego pack and pay any outstanding costs. We can then direct you to your sessions. After the session just come back to the rego desk to find your next game. You can register either as an individual or as team. If you register as a team, this allows you to schedule yourself in the same game sessions as your friends. To sign up go to our Register page. Create yourself a login and then just follow the prompts. If you are registering as an individual you'll still need to supply a team name (one of the quirks of our rego software). Just use your name in these cases. Our registration system is dynamic so as games fill, they get closed off. You can always see how many other players are in a session and you can always log back in and change your sessions right up until just before the convention. All games can run with less than the maximum number of players so pick the sessions that best suit you. If you have any more questions, just get in touch with us through our Contact page.